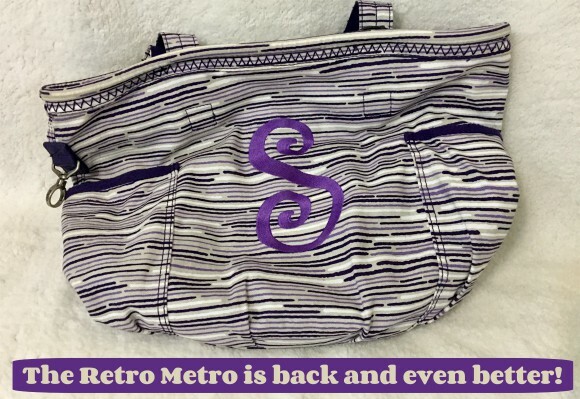 Stacy Tilton Reviews: The Retro Metro is back and even better! The Retro Metro is back and even better! I have to say when I heard the Retro Metro was coming back this fall I was ecstatic. It was one of my favorite purses ever and I like many others was heartbroken when I saw it missing from my Thirty-One catalog. It's so roomy and even for the size lightweight to carry. As a mom I like having the extra space if I need it to toss in some snacks etc. and not have to worry I'm overloading my purse. Thankfully it's back and in some really stylish colors too. And since I have one (okay a few more than one) of the previous versions of the Retro Metro I thought it would be nice to share with you what some of the differences are between them. The overall size didn't really seem to be much different, but right off you can tell that the quality is. It has a nice sturdy feel and lots of reinforced stitching. First thing I noticed was they removed the fringed trim around the top and added some nice reinforced bold colored stitching instead. I have to say I like this better, the fringe wasn't really one of my favorite attributes on the older version. Another thing they did that was very noticeable was removed the interior lobster claw clasp and placed it on the outside just above one of the end pockets. The jury is still out for me on this change though. I like having the outside clasp because it's very handy to use for my car keys to make them easy to grab quickly. However I really liked having a clasp on the inside to hang things from inside my purse too. Speaking of the side pockets - they are bigger which is quite nice. On the inside you'll still find the zippered pocket as well as the two flat pockets as the previous style had. I did think the updated version had nicer pockets though. And instead of the patch where you were supposed to write you name (but I don't think anyone ever did) you'll find a nice saying instead. Another really nice touch. On the overall I personally love the updates to the Retro Metro and am glad that even though it had to disappear for awhile it's back and even better! And while I have your attention I also wanted to point out a few must have accessories for your Retro Metro. I'm one of those people that used to think everything had to match perfectly to a T. But after my trip to the Thirty-One conference a few months ago I have a whole new perspective when it comes to accessorizing. Sometimes mixing colors and/or patterns can actually turn out to be a really nice thing. Take for instance my combination of the Grey Geo Strip Retro Metro and the Lil' Scribble accessories. There wasn't any accessories to match exactly so I thought that it was the perfect time to test out my new perspective on things. And if I do say so myself I think they go together quite well. In short you should always have an open mind when choosing colors/patterns to make a set, you never know what you might come up with! 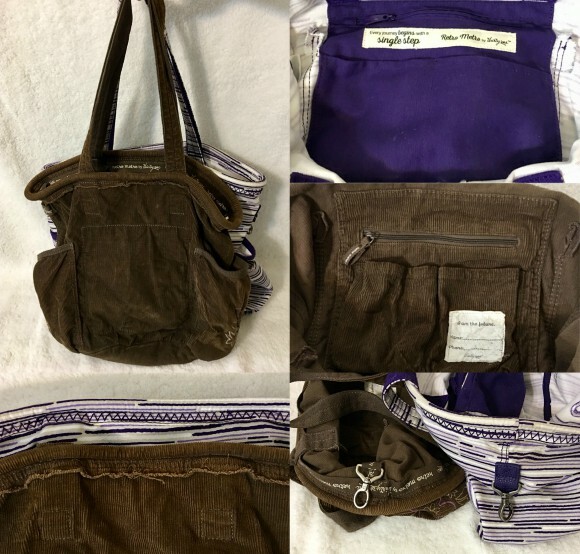 I've always like purses made out of corduroy - they have a really nice look. This is cool, I need a new purse. I'm not a big fan of purses, but it would be cool for those that are. I love the size of the bag. Really like to matching accessories. These look like nice bags, I think my niece would love them. I love this bag. I have to admit that purses are my major weakness. Retro Metro seems so stylish and useful to have. I would definitely be happy to have this bag. This is cute, my daughter would love this! She loves handbags. I love how big that is. The older I get, the bigger my purses seem to need to be.